Golden Platter Foods of Newark, N.J., is recalling approximately 31,662 pounds of ready-to-eat turkey, chicken, veal and beef products. 24-lb bulk cases containing 3-lb. plastic liner retail bags of “Western Beef Fully Cooked CHICKEN TENDERS,” with case code 04952. 24-lb bulk cases containing 3-lb. plastic liner retail bags of “Western Beef Fully Cooked Chicken Patties,” with case code 04951. 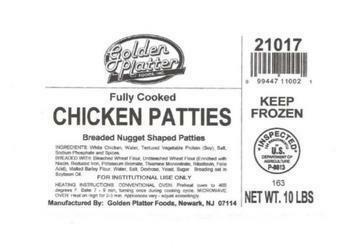 10-lb bulk cases of “Golden Platter Fully Cooked CHICKEN PATTIES Breaded Nugget Shaped Patties,” with case code 21017. 24-lb bulk cases containing 3-lb. retail bags of “Western Beef Fully Cooked CHICKEN NUGGETS,” with case code 04950. 20-lb bulk cases of “Golden Platter HALAL Fully Cooked BEEF MEAT BALLS,” with case code 12012. 10-lb bulk cases of “Golden Platter HALAL Fully Cooked CHICKEN NUGGETS Breaded Nugget Shaped Patties,” with case code 21020H. 10-lb bulk cases of “Golden Platter Fully Cooked Breakfast Style Turkey Patties,” with case code 18610. 10-lb bulk cases of “Golden Platter HALAL Fully Cooked Breaded BEEF PATTIES,” with case code 11001. The recalled products, bearing establishment number “EST. 8813” inside the USDA mark of inspection, were shipped to retail and institutional locations in Massachusetts, New Jersey, New York and Pennsylvania.